Ascaphus truei occupies high energy streams in the mesic forests of the Pacific Northwest. Their distribution extends along the coastal ranges and Cascade Mountains from British Columbia to northern California, with several disjunct populations occuring east of this area (Nielson et al., 2001). Ascaphus is referred to as the tailed frog because of the presence of an intromittant organ that resembles a tail. This "tail" is used during mating to transfer sperm to the female; thus, Ascaphus utilizes a form of internal fertilization. The tadpole of Ascaphus develops over an unusually long period of time. It may take up to three years for the tadpole to completely metamorphose and up to 7 to 8 years for it to reach sexual maturity (Daugherty and Sheldon, 1982). Ascaphus is one of the earliest diverging members of Anura and is often placed as the sister taxon to all other living frogs (Ford and Cannatella, 1993). Historically, both Ascaphus and Leiopelma were grouped together into the Amphicoela based on primitive characters such as the presence of free ribs, amphicoelous vertebrae, epipubic cartilages, and the caudalipuboischiotibialis muscle (Green and Cannatella, 1993). However, more recent studies break the Amphicoela into two less inclusive groups, the Ascaphidae and Leiopelmatidae (Ford and Cannatella, 1993). This adult specimen, collected in Benton Co., Oregon, was made available to The University of Texas High-Resolution X-ray CT Facility for scanning courtesy of the University of Michigan Museum of Zoology. Funding for scanning was provided by a National Science Foundation Digital Libraries Initiative grant to Dr. Timothy Rowe of The University of Texas at Austin. This specimen was scanned by Matthew Colbert on 14 November 2002 along the coronal axis for a total of 615 1024x1024 pixel slices. Each slice is 0.0737 mm thick, with an interslice spacing of 0.0737 mm and a field of reconstruction of 31.0 mm. Brown, H.A. 1989. 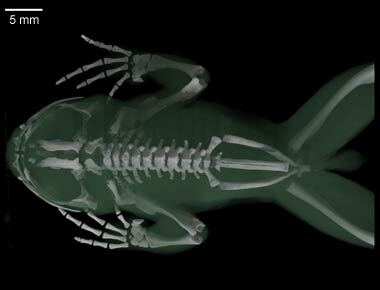 Developmental anatomy of the tailed frog Ascaphus truei, a primitive frog with large eggs and slow development. Journal of Zoology (London) 217:525-538. Bury, R.B. and M.J. Adams. 1999. Variation in age at metamorphosis across a latitudinal gradient for the tailed frog, Ascaphus truei. Herpetologica 55:283-291. Duellman, W.E. and L. Trueb. 1986. Biology of Amphibians. Johns Hopkins, Baltimore, 670 pp. Ford, L.S. and D.C. Cannatella. 1993. The major clades of frogs. Herpetological Monographs 7:94-117. Green, D.M. and D.C. Cannatella. 1993. Phylogenetic significance of the amphicoelous frogs, Ascaphidae and Leiopelmatidae. Ethology Ecology & Evolution 5:233-245. Green, D.M., T.F. Sharbel, R.A. Hitchmough, and C.N. Daugherty. 1989. Genetic variation in the genus Leiopelma and relationships to other primitive frogs. Zeitschrift fuer Zoologische Systematik und Evolutionsforschung 27:65-80. Karraker, N.E. 2001. Ascaphus truei (tailed frog). Herpetological Review 32:100. Lewis, E.R. 1981. Evolution of inner-ear auditory apparatus in the frog (Ascaphus truei). Brain Research 219:149-155. Nielson, M., K. Lohman, and J. Sullivan. 2001. Phylogeography of the tailed frog (Ascaphus truei): implications for the biogeography of the Pacific Northwest. Evolution 55:147-160. Nishikawa, K.C. 1991. Kinematics of prey capture in the tailed frog Ascaphus truei (Anura: Ascaphidae). Zoological Journal of the Linnean Society 103:289-307. Pauken, R.J. and D.E. Metter. 1971. Geographic representation of morphological variation among populations of Ascaphus truei Stejneger. Systematic Zoology 20:434-441. Reiss, J.O. 1997. Early development of chondrocranium in the tailed frog Ascaphus truei: implications for anuran palatoquadrate homologies. Journal of Morphology 231:63-100. Ritland, R.M. 1955. Studies on the post-cranial morphology of Ascaphus truei. I. Skeleton and spinal nerves. Journal of Morphology 97:119-174. To cite this page: Dr. Amy Balanoff, 2003, "Ascaphus truei" (On-line), Digital Morphology. Accessed April 19, 2019 at http://digimorph.org/specimens/Ascaphus_truei/adult/.